Soft look and feel of this unique ceramic square bath accessory design. Made in Germany. Tumbler: Soft matte color tone on outside and white on inside. 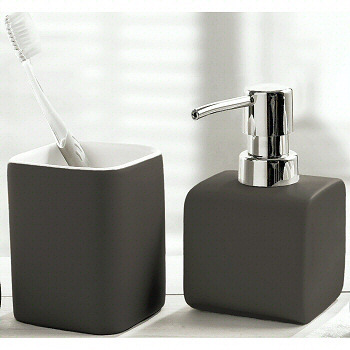 Soap Dispenser: Very soft to the touch with soft matte finish. This dispenser has a chrome pump and holds 8.8 ounces of liquid soap. Soap Dish: Unique thick profile with the same soft matte finish. Toilet Brush Set: Beautiful ceramic toilet brush set with soft matte finish.